Piriformis syndrome is not something that most people know about, but if you have it, it can dominate your life. In simple terms, tightness or dysfunction of the piriformis muscle causes both pain and lack of function. The piriformis muscle(s) is located partly within the back of the pelvis, and partly at the back of the hip-joint. It is a flat muscle that is part of the group of muscles in the buttocks responsible for sideways (lateral) turning (rotation) of the hip joint. The sciatic nerve(s) starts in the lower back and runs through the buttock and down the back of the leg all the way to the foot. It is the longest and nerve in the human body. The sciatic nerve supplies nearly the whole of the skin of the leg, the muscles of the back of the thigh, and those of the leg and foot. It is linked to spinal nerves in the lower back. 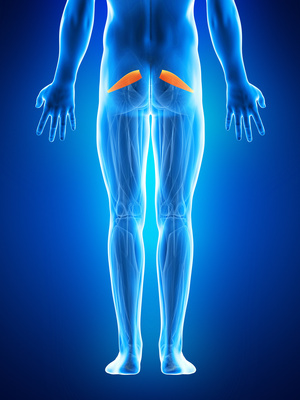 Piriformus syndrome occurs when the piriformis muscle presses, or irritates the sciatic nerve. Simple as that. There are many different possible reasons why this irritation occurs – injury, poor posture, and lack of muscle flexibility are some of the common ones. Around 17% of the population (source) have their sciatic nerve running through the piriformis muscle rather than beneath it. These people are unfortunately much more likely to suffer from piriformis syndrome as the sciatic nerve is much more easily irritated. Anything that either shortens the piriformis muscle, or over develops it, is likely to lead to piriformus syndrome. Sitting for prolonged periods is highly likely to do this, due to a severe shortening and tightness of the hip flexors (among other muscles). The solution? Stretching and balanced development of various opposing muscles. This is a whole new topic for a post which we will write soon. If you do suffer from piriformis syndrome, you should feel encouraged that with some understanding of the causes, and sensible stretching, you are likely to be able to improve your health greatly. Neck Tightness? The ARC Might Be What You Need!